Out of all the Aussie songs I know, this is the one that most evokes “home” for me. My earliest years were spent growing up in North Queensland. 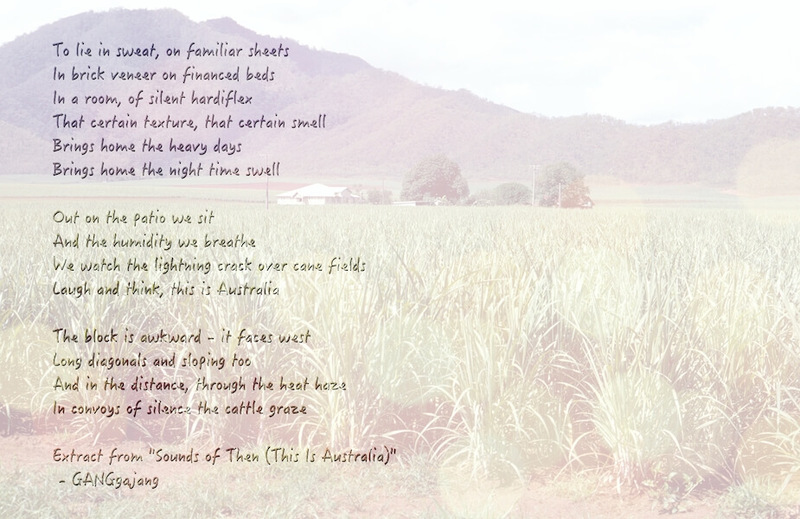 I still have dreams of sugar cane fields standing tall, the sugar cane trains rattling amongst the fields and highset Queenslander homes with their wraparound verandahs. One of my earliest memories is peering through the window at a storm gathering on the horizon – watching lightning flickering among the dark clouds and listening anxiously to the distant rumbling…coming closer. Storms were certainly an event. I remember humidity so thick I’d imagine swimming through the air. The pressure would build throughout the day until the storm clouds started to appear. After carefully closing the windows, Mum would turn on lights as darkness rolled in with the storm clouds. Finally, the storm would break with an almighty crack overhead and the rain would immediately lash down on our iron roof so hard the sound reverberated in my bones. And when the rain stopped, that heavy, sticky humidity poured right back over us. We moved around that area a fair bit in my first five years. Lots of isolated farms and houses. I seldom saw other kids. It was mainly just Mum and me, and Dad when he came home from work. We moved to Brisbane when I started primary school. We were barely civilised at school. Little barbarians – all scabbed knees, flying hair and bare feet. Such freedom. I still remember how we could get so immersed in our playing we actually believed the worlds we created. Those worlds were so vivid – real and alive and breathing. When did I lose that ability? I remember the school playground – swinging across the monkey bars and jumping down into the dirt. My hands would be pink with the rust and smell like iron. Or running around like mad things playing tiggy or brandy with the tennis ball thrown full bore. The resulting bruises were later compared to see whose were the most impressive. I rarely wore shoes anywhere – sometimes thongs on the hottest days – hopping from shadow to shadow or sprinting across concrete when it was extra hot in summer. Over time the skin on my feet grew thicker but never enough to avoid the bindi-eye in the backyard. During the long hot, humid summer holidays, I ate large pieces of watermelon that tasted cold and sugary. Or mandarins the size of fists so juicy and sweet. And Mum made me eat mangoes on the back steps because the juice would dribble down my chin, hands and my clothes onto the floor. Stickiness was a state of being. Then a quick wash and drink from the hose before heading off to play. Summer was full of possibilities. I remember Mum giving me maybe 50c in the morning, then I’d grab my bike, heading off with my dog, Charlie, not to be seen again until it was getting dark. Charlie and I travelled for miles sharing adventures. Down to the mangroves and mudflats; up, around and through my school; travelling through the streets; going fishing – sticking our noses into all kinds of places. I’d collect strange rocks and shells and bring them all home. Meet and play with random kids. Climb trees. Find secret places and dream dreams. If I got hungry, I’d nip into the fish and chippy and buy the minimum chips – 20c worth wrapped up in newspaper. It would be a huge amount and I’d sit on the jetty and share them with Charlie and the seagulls while watching jellyfish bob in the waves. Sometimes Mum would give me stale bread to throw to the birds and Charlie would get so jealous I would have to share some with him as well. At the end of the day as the evening set in and the mozzies started to bite, Mum would be at the back door calling my name to come in to dinner – maybe if I was in earshot I would respond. Otherwise, no worries, I’d be home when I was hungry. Summers were so long. They seemed to last forever. This entry was posted in Genealogy, Memories, Story and tagged Australia, Family History, Genealogy, Memories, Queensland, Story. Bookmark the permalink. Such wonderful memories of childhood freedom. Thanks for reminding me of those simple pleasures. Thank you, Jill. I’m glad it brought back great memories. I loved this, it seems things were so different then… time when kids could be free and safe.. Thank you, Chris! I was trying to capture the feeling and atmosphere of my childhood rather than all the explicit details. I’m glad it resonated with you, too.